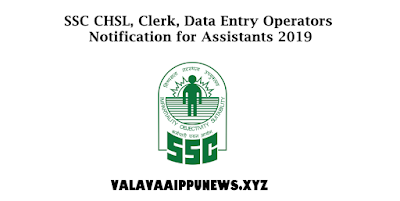 SSC CHSL, Clerk, Data Entry Operators Notification for Assistants 2019 | PBSMLINKS | A Complete Information Sharing Portal!! Date of Tier-II Examination (Descriptive Paper): 29.09.2019Fees Details :Fee payable: Rs 100/- (Rs one hundred only). Assistant, Postal Assistant/ Sorting Assistant and Data Entry Operators for various Ministries/ Departments/ Offices of the Government of India. Data Entry Operator, Grade ‘A’: Pay Band-1 (Rs. 5200-20200), Grade Pay: Rs.